IS THE WORLD READY FOR AN EVER BIGGER CHINA?
"" ... when China becomes bigger and bigger, there will be more tensions between China and the rest of the world.…..First, ..., most likely the Chinese economy will face bigger and bigger challenge down the road because economy is becoming more and more complex, and society is becoming more and more multi dimensional. 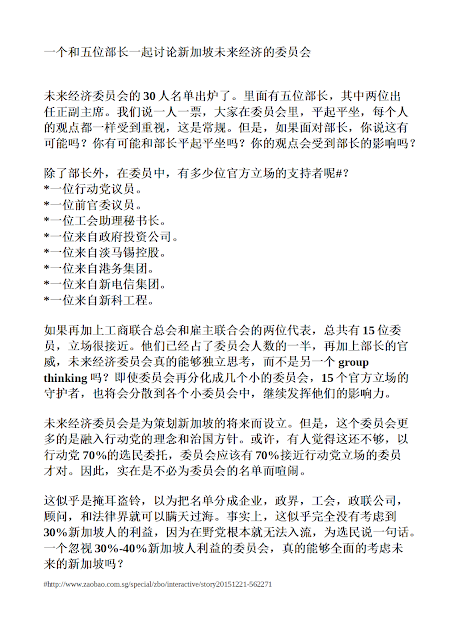 The third thing, ..., is that would the continued emerge of China, the relationship between China and the rest of the world, will be more and more complicated... major conflicts might be avoided. "" possible to extend into the future. France faced her survival challenges. 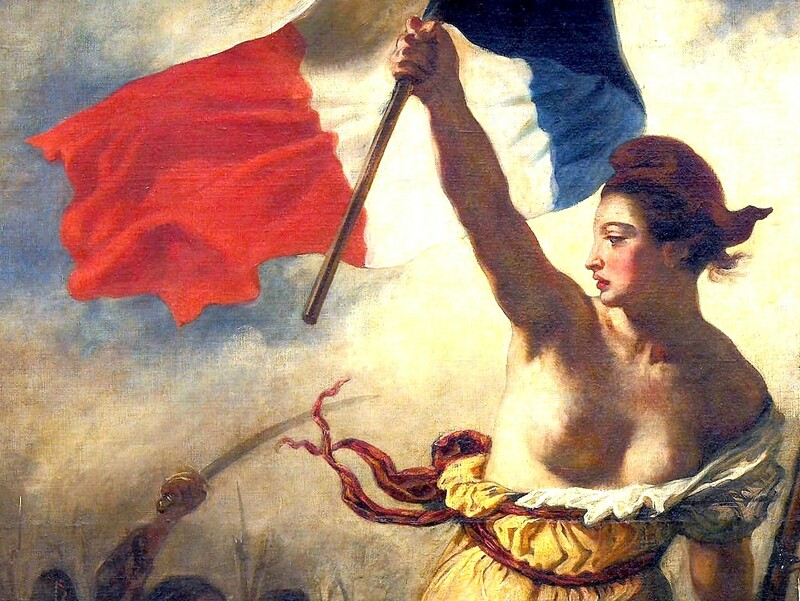 Can we or can we not rule out a Sixth French Republic? movements in Asia, Africa and other parts of the world. movement, gained rights of votes before women). colonies begun to fight for their independence. Africa and Asia in the 20th century. unpredictable and even horrific or terrific. practice democracy, national assembly, rights and liberty. Many government departments, for example, URA, HDB, LTA, IDA, etc. have also put forward their proposals for a Smart Nation. Below is just one of the examples. Our future economy, as a city state, is linked to the digital world. IDA claims we will be the first nation in the world using and ‘harnessing technology’ in developing a smart city (= nation). In a smart city, how can we create values for jobs, companies, resources, technology and markets? When Minister Heng talks about ‘creating’ rather than ‘adding’ values, it looks like we are doing some things different from the past. But how different? 'Adding values' seem to be an easier job, for example, bringing in foreign workers, building casinos, giving tax incentives to foreign companies, etc. 'Creating values' will need innovations and making things from nothing, more risks, more freedom, transparency and democracy. Wow! Can the same old political structure of one-party rule still be relevant in the future economy? Professor Dominique Boullier of Sciences Po Paris outlines a smart city model which involves certainties and uncertainties; attachment and detachment. There are four components in the model: Good Old, Smart, Data and Wiki city. GE2015 suggests Singaporeans prefer to remain in ‘certainties’ - from Good old city to Smart city. However, we also prepare to move from ‘Attachments’ to ‘Detachment’. ‘Gold old city’ model is very much a colonial model and SG50 is part of it. Singapore still feels comfortable to work under ‘models’. We will use all the latest technology, research and consultancy to develop our smart city model. no model at all under Data City and Wiki City. You create values from big data which has no previous pattern or need to share information in a crowd. The information and media control in Singapore will pose a challenge in these two sub-components. Perhaps, we are only happy to achieve 70% coverage of the jobs and market - controlling all components of ‘certainties’ models and some components of ‘uncertainties’ models. Is this the future economy of Singapore - a smart city flying with 60% or 70% capacity? In Marxism, capitalism comes before socialism and communism. Marx thinks after the working class gains class consciousness, they will mount a revolution against the capitalists. However, Marx’s Theory of Crisis failed and interestingly, with the help of government, capitalism survives as seen today. Singapore is a beneficiary of capitalism. Our pragmatic model of capitalism has created wealth and progress for Singaporeans. In Marxism, it is an ideal situation for socialism as class aware emerges. In fact, all so-called communist states, past and present, have never experienced (modern) capitalism before calling themselves communists. Why has communism not happened in western industrial world or authoritarian capitalist economy, like Singapore or China? Professor Ian Shapiro of Yale University explains the failure of Marx’s Theory of Crisis and thinks government and market reflection/adjustment have helped to prevent the fall of capitalism. (see video below). For Singapore to move forward, it is important to look at the theory of crisis as Singapore is already at the advanced stage of capitalism. Judging from the income per capita, we are already one of the top countries in the world. Marx’s failed theory and experience is a learning curve for Singapore or in another word, to prevent it to happen, political change from authoritarian to democracy does have its role. How can we solve current capitalism problems facing Singapore? Can the PAP come out with a solution or alternative for Singapore with “The Future Economy” committee headed by Heng Swee Kiat? Is a strong government necessary a stable government? The above crises have not gone away. These economic and social problems continue to occupy the headlines in the world. And we have to understand the concept of government too. It certainly involves Congress or Parliament. Management of liquidity risk, financial crisis, foreign exchange risk, CPF, foreign reserve and sovereign funds will continue to be challenging issues. The large foreign labour force and increasing property price and rental, and inflation are indicators of falling profit. Lack of creativity and innovation makes shifting or finding new industries difficult. State monopoly (GLCs) already occupies a big share of our economy. Lack of entrepreneurship and lack 'economy of smallness' activities will make government-led businesses continue to dominate the economy. Super-rich and tourists are attracted to Singapore for consumption. The government wants to increase population to increase consumption. Low birth rate means low consumption too. Singaporeans are not comparing salary with foreign workers. They are comparing with foreign PMETs. There are also demands for poverty line or minimum wage to be established. All the above are the challenges for the future economy of Singapore. However, the fundamental problem is still politics. 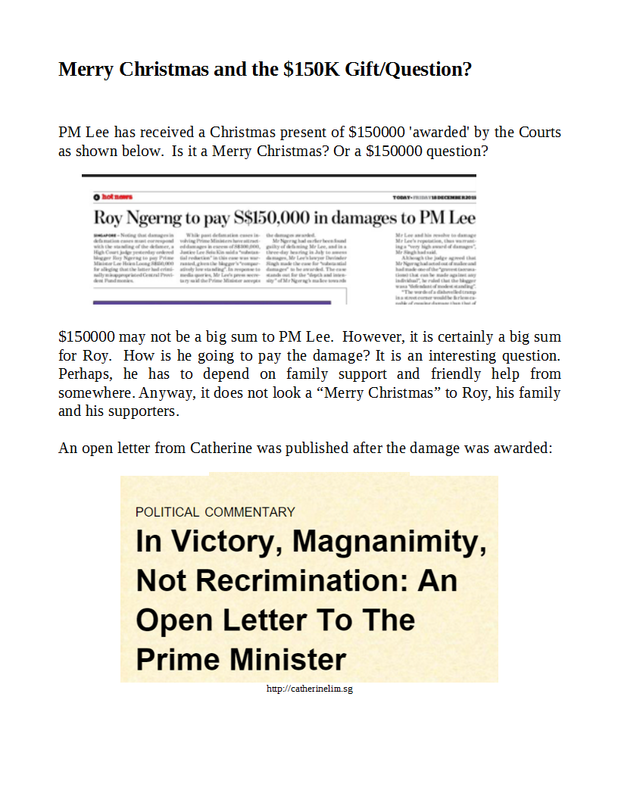 One may argue Singapore is lucky as we have a strong government. And government as explained by Prof Shapiro is the key saver for capitalism. But can a (narrow definition) government without ‘checks and balances’ able to solve the capitalism crises? Even that, we still need to solve issues like entrepreneurship, technology, economy of smallness, psychological comparison, etc. Government as a rescuer of capitalism, under the attack of Marx’s Theory of Crisis, may explain why the PAP received strong mandate in GE2015. However, it does not mean strong mandate with an unchecked government can solve the crises. Whether in USA or Europe, debates in Congress or Parliament are the necessary steps of crisis management. 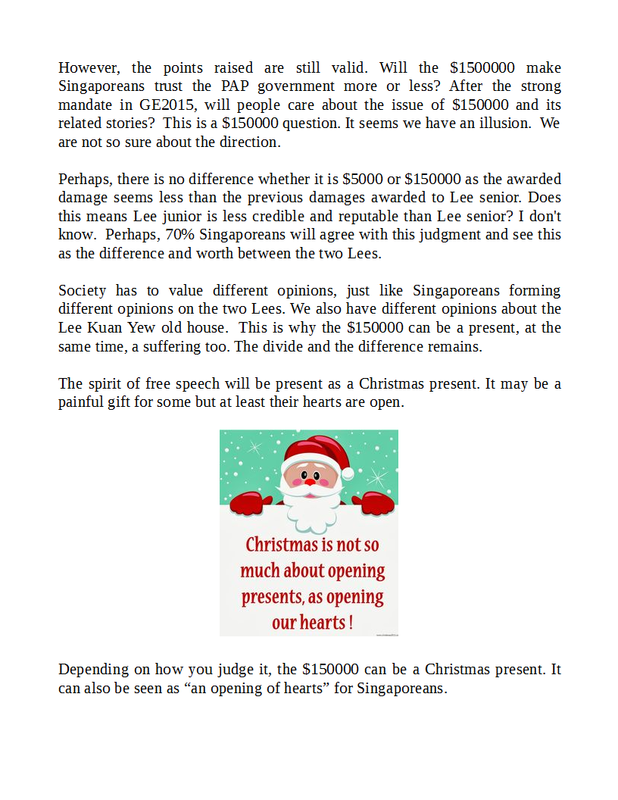 Of course, the PAP government may claim debates are not necessary as they can do self-check and self-debate. And Singapore is an exception.